As I have written about in the past, you can have many, many causes of the symptoms of hypothyroidism. Just going to your PCP or endocrinologist and getting a prescription for thyroid hormone replacement doesn't handle the cause in over 83% of thyroid disorder sufferers. Most cases of hypothyroidism and other thyroid problems in the United States are due to Hashimoto's, which is an autoimmune attack on thryoid tissue, enzymes and/or thyroid hormone transport proteins. Fortunately with proper, in-depth testing, Dr. Karl R.O.S. Johnson, DC can help you identify why you are having symptoms of hypothyroidism and can help you regain balance in your health. One such test is called Spectracell Micronutrient Testing. 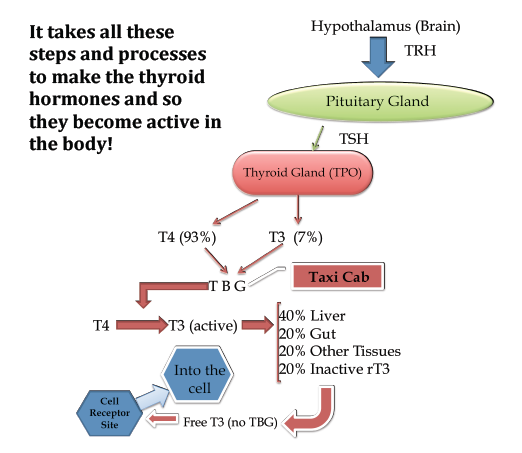 Your body cells are all influenced by thyroid hormones. It takes at least ten steps for your body to get the thyroid hormones to affect your cells many functions. Enzymes are the engine that drive all our body's biochemical processes. Vitamins and minerals are the keys that allow the enzyme engines to turn on! Therefore, it should come as no surprise that many nutrients are needed to power the enzymes that make all the steps possible. The realization that vitamins and minerals are so important for living should drive all of us to eat whole, natural, organic foods because they have the most nutrients. Many people do not realize this and eat a diet that has the acronym of S.A.D., which stands for Standard American Diet. Unfortunately the S.A.D. has lead to the meteoric rise of many chronic diseases seen these days in the United States. I hope that my blog has some influence to help change this "S.A.D." statistic. To say that the thyroid hormones are important to overall body function is, to most people, a revelation. I explain about how important the thyroid hormones are in a previous blog post. Check it out for yourself. You can download a helpful document that diagrams how all these nutrients can contribute to hypothyroidism symptom with references by clicking here.